Yes, this is a cliché phrase but oh-so-appropriate for this post’s project. You can’t judge a book by its cover, so the saying goes. Well, even a line drawing to a garment design, heck – even the finished garment itself – can hide construction secrets…I’m specifically talking about the good and wonderful kind. This jumper is definitely a case in point! It’s made of a warm and soft common flannel made to look like a much fancier woolen suiting, with pockets and a front closure that are really not workable, and a back zipper that you can’t tell is really there (that’s why they’re called invisible, duh). This garment carries a vintage vibe yet is a very modern release. 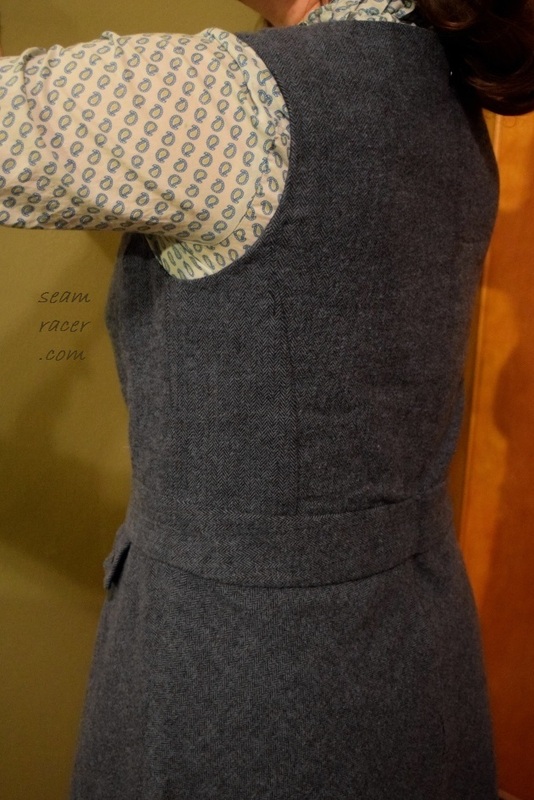 The pattern itself is called a deceiving “Waistcoat Bodice Dress” to designate that it is a jumper made to look like a dress that has a vest-style top half. You’d never guess how I finished the inside, either. Confused much? All you really need to know is that I love this make! It came together wonderfully, is freaking cute, and is crazy cozy for chilly weather. 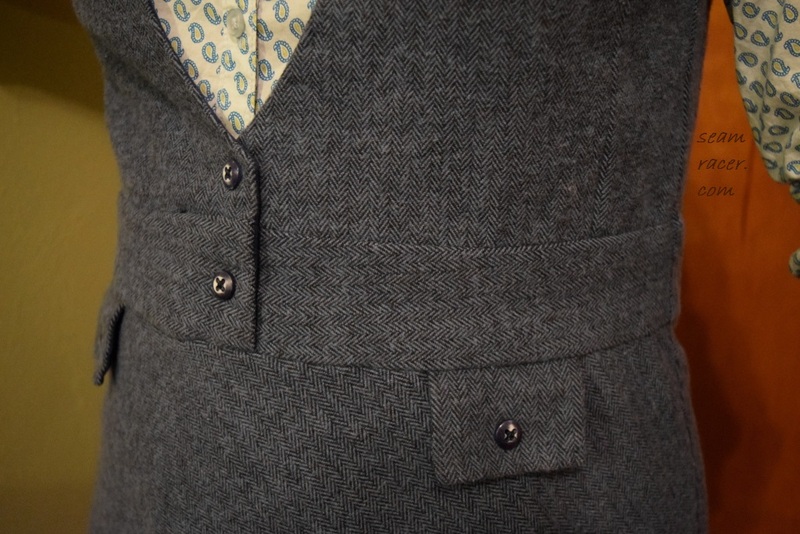 It really brings a jumper to another level, and makes the most of its on-point details. 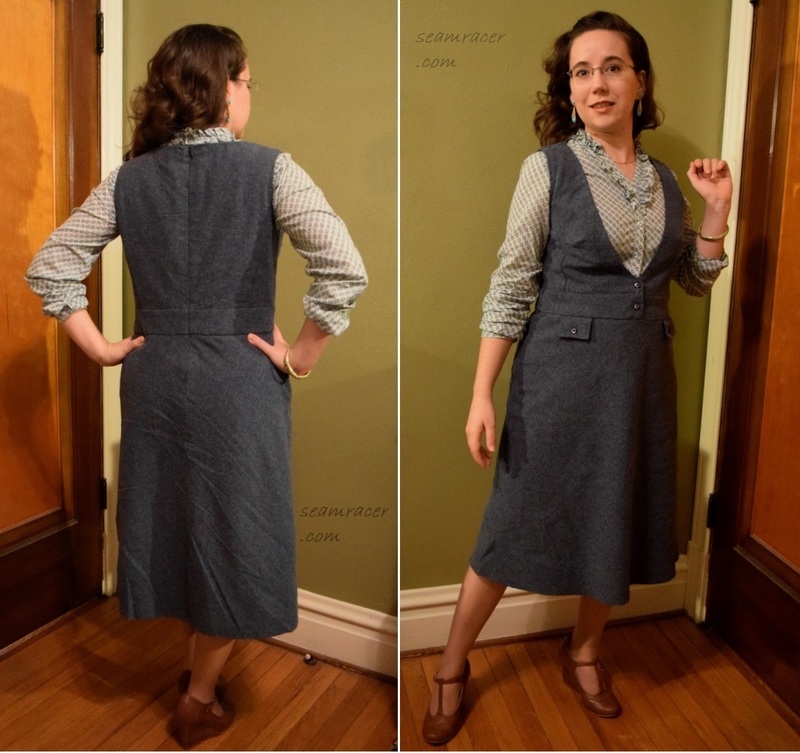 This was made as my last 2018 “Burda Challenge” make for the month of December. I know, I’m running late to post it on my blog, but better late than not at all! 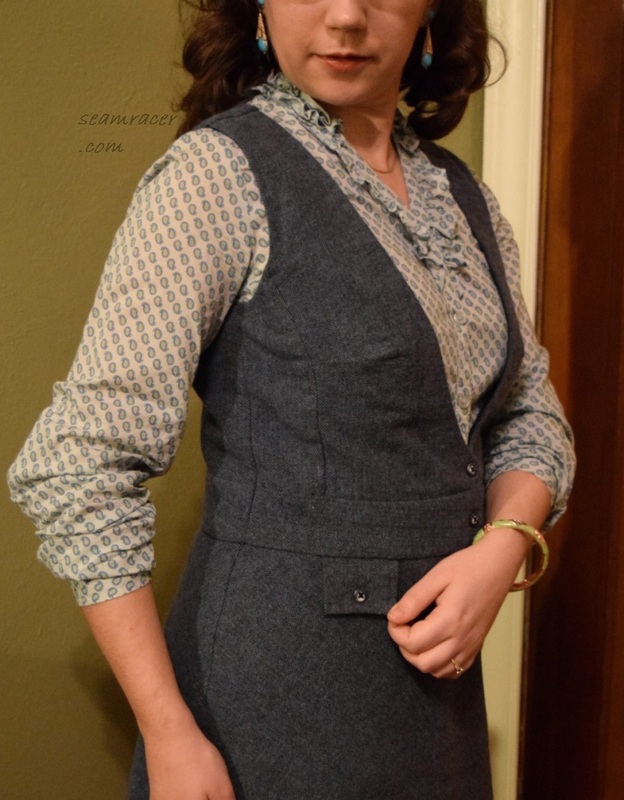 I HAD to make this Burda “Jumper Dress” after seeing their version paired up with the vintage 1963 ruffled neck “Beatnik Blouse” which I had made in November. However, the jumper has such great wardrobe potential for me that it matches up to almost every other winter blouse I have, especially the Burda scrunched neck Turtleneck. I paired it in these pictures with an older RTW blouse which I felt brings out the 1970s vibes that the jumper has…besides, it is more paisley and it brings out the turquoise in my outfit (one of my favorite colors!). I am wearing my Grandma’s vintage 70’s drop earrings, and some modern T-strap wedges to match. THE INSIDES: Full lining means smooth insides with nary a seam showing…I love it! TOTAL COST: The flannel was found at JoAnn, and it was on sale on top of a coupon, so with the free scraps I had on hand for the lining, this cost about $15 or less. Now, as for any Burda Style pattern, printing and/or tracing is necessary to have a usable pattern to lay on your desired fabric. My pattern was traced from the inserts in the magazine issue, but most other patterns are available online as a downloaded PDF that needs to be printed out and assembled together. What works best for me is to use a roll of thin, see-through medical paper to trace my pieces out. It’s at this preliminary step that you pick out your proper size. Some people add in your choice of seam allowance width directly to the pattern while some as they are cutting out the fabric pieces. A scissor with a magnetic ruler guide helps immensely to quicken along the step to getting a finished pattern prepped. Sorry to repeat something you might already know, but this is just an “FYI” for those that don’t. When tracing it out and doing the cutting, I realized the individual pattern pieces themselves seemed quite small and easy to work with. I was almost doubtful that they would turn out a garment which would actually fit a normal human body. But, yes – it did turn out beautifully without any confusion or problems. The sizing was right on, and it came together rather quickly…I actually spent just as much (maybe more) time on the finishing touches. 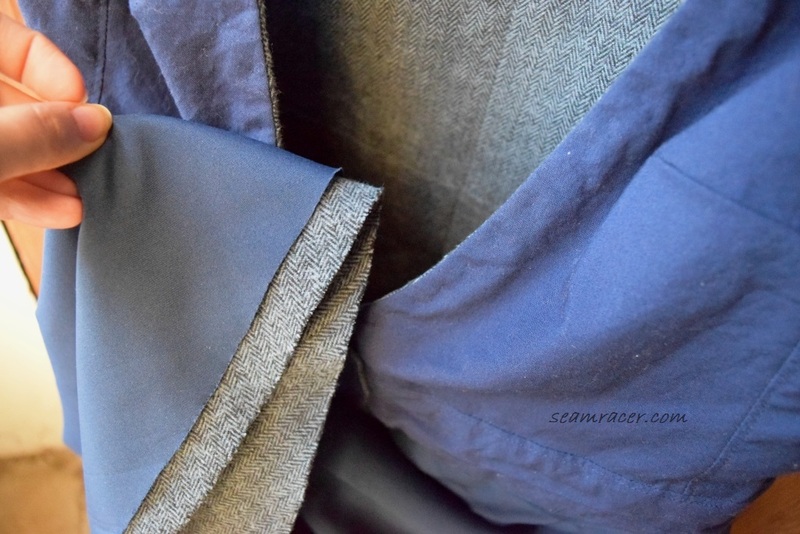 The fabric appears so dressy and I wanted to keep up the sham by taking the extra time to invisibly hand-stitch all the edges together, even on the pocket flaps, as well as the inner linings. The only tiny thing that I did change to this was the button placement. I felt that three buttons down the front mock closure is overkill, while free-flapping pocket flaps are weird without buttons. The buttons that were in my stash on hand which I did like for the jumper were only four in number anyway. I wasn’t only justifying what I had on hand, though! If you’re going to make part of the ‘dress’ look real, do it all the way. Flannel is one of those “sticky” fabrics (like corduroy) that need a lining to hang gracefully or have the proper body, especially if one plans to wear more winter layers under them. I find that the more flannel gets washed it loosens up and changes shape, and I didn’t want that to happen to this jumper…at least the top half of the body. This, I lined the waistband and above in an all-cotton broadcloth which also sticks to the flannel, keeping it in its original shape, besides feeling sturdy and warm. I did iron a 3 inch width of interfacing to the wrong side of the flannel all around the entire neckline before sewing together to also help keep the flannel in check. However, for the skirt portion I chose a silky buff finish polyester. The skirt is slim and cut on the bias so it has a lovely body-hugging shape that is slimming. Choosing a poly to line the skirt keep it flowing and cling free when I wear tights or even pants under this jumper. As the skirts (lining and flannel) are cut on the bias, I have left the hems unfinished and raw. The bias keeps them from fraying so they are good as they are with no hem confining the shape there! 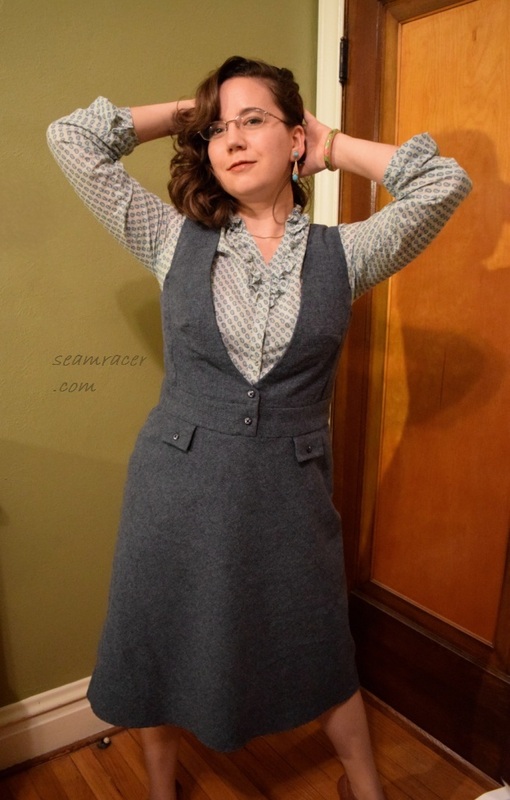 I had been saving this projects flannel for a vintage winter shirtdress, complete with faux leather accents as I had imagined. However, a jumper is a more versatile in between the choice of wearing either separates or a dress, and – as I said at the top of this post – this Burda one is so smart! 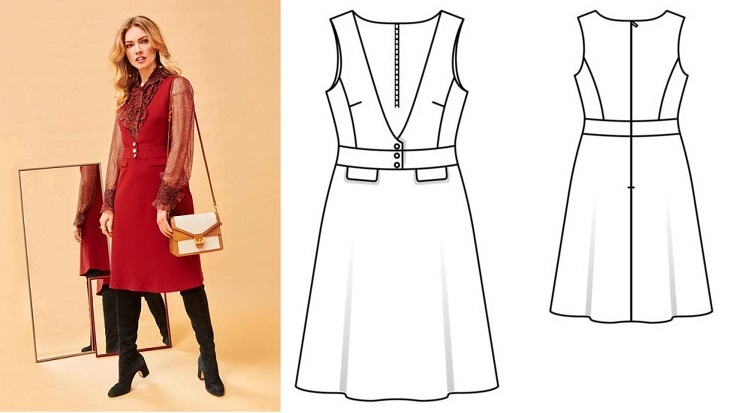 It really lets the blouse underneath still shine (most jumpers don’t do that) by having an open front bodice that is shaped so well by panels and darts it actually stays in place nicely over one’s curves while being so open in styling. I’m such a sucker for clothes that are chic enough you forget to realize they are both cozy and comfy at the same time. Things are not what they seem at first view when you sew…especially when you’re talking about something off of my machine tables! Tell me about a sewing project of yours that has some great surprises to it!